Please follow these easy steps to configure your business email on Outlook 2007. Step 1: If you are using the Business Email Provided by BrandWeb Direct, you may first need to enable POP or IMAP in your email account. By default we enable these for you, unless otherwise specified. Step 2: Open Outlook. Click on Tools and select Account Settings. Step 3: Click New. Choose E-mail Service, select Microsoft Exchange, POP3, IMAP, or HTTP, and then click next. Step 4: You would now need to fill all the necessary details These are the details we would provide you (Or if you have bought your email service from another provider, the details that they have provided you). Step 5: Check the Manually Configure box and enter the details provided as shown in the picture. Password: Enter the password provided. Step 7: Now click on More Settings and then select Outgoing Server. 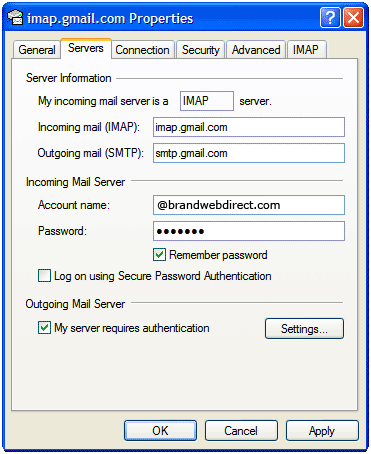 Click on My outgoing server (SMTP) requires authentication and select Use same settings as my incoming mail server. Step 8: Click Advanced on the top and check the box next to This server requires an encrypted connection (SSL) under Incoming Server (POP3). Step 9: Enter 995 in the 'Incoming Server' box. and 465 in Outgoing server (SMTP) box. If you are using TLS, enter 587 as shown below.